The St. Louis Blues have added a new Goaltending Coach to their staff. GM Doug Armstrong has officially welcomed Jim Corsi to the club. Corsi, ironically enough, has worked with the Buffalo Sabres for the last sixteen years. He has over twenty years of coaching and playing experience combined. 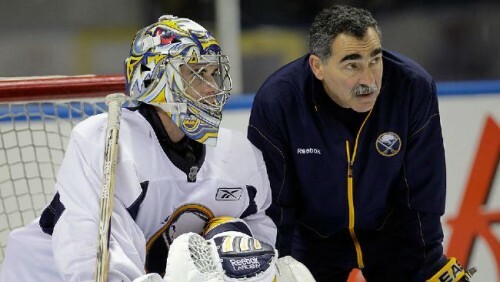 He spent time coaching Blues 2013-2014 Goaltender, Ryan Miller and a few other Vezina Trophy winners. Jim Corsi has coached on many levels, included junior, collegiate and European leagues. Not only did he coach internationally, but he played in international tournaments as well, including 8 appearances with Italy for the Ice Hockey World Championships. He represented Italy once more in the 1984 Olympics. Overall, Jim Corsi has an extensive background and obvious capabilities to take on the Goaltending Coach position for the Blues. Let’s hope he can push Brian Elliott, and Jake Allen, for that matter, to new heights for the 2014-2015 Season.